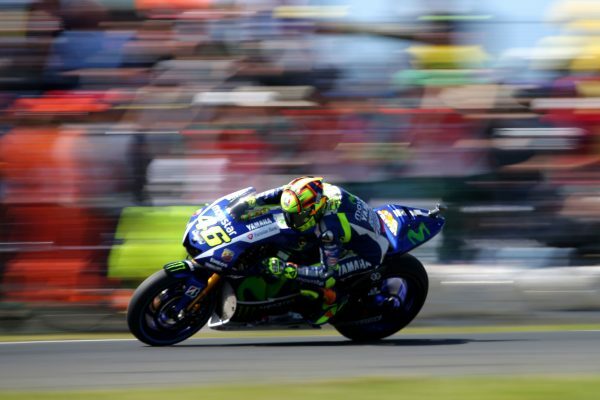 The 2019 Michelin® Australian Motorcycle Grand Prix attracts the world’s best riders to Phillip Island. 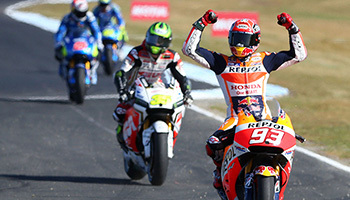 With the likes of Valentino Rossi, Marc Márquez and Aussie Jack Miller accelerating to insane speeds and weaving through tight turns, you’ll feel the electric atmosphere of Phillip Island as these two-wheeled superstars burn up the track. Live the high life in an exclusive marquee or capitalize on the birds eye view of grandstand seating. Travel & Sports Australia can place you in the heat of the action in 2019 with our Michelin® Australian Motorcycle Grand Prix packages. All ticket types are on offer in 2019 and are coming soon! 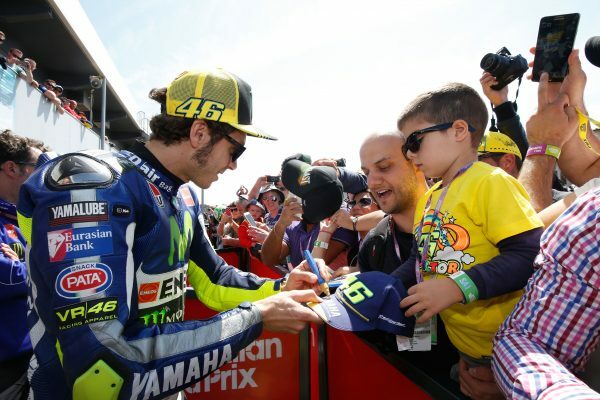 Jump on board our priority list below to be the first to hear about Phillip Island MotoGP tickets and packages. Located at the apex of the circuit’s steep descent out of Turn 9, Lukey Heights Grandstand provides cross-circuit views all the way from the Southern Loop through arguably the track’s most challenging section of racing. Turn 9 itself is one of Phillip Island’s most exciting corners with many a rider coming a cropper on this demanding section of the track. 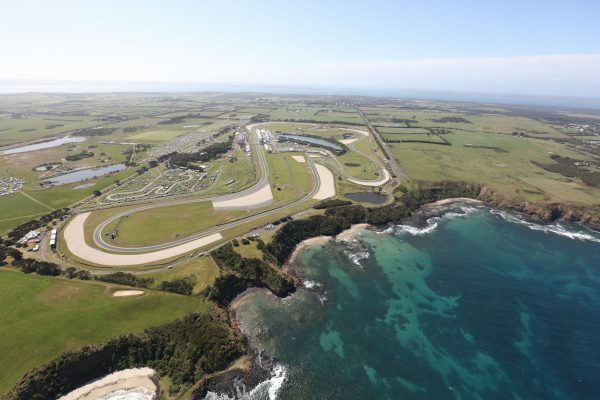 Named for Aussie racing legend Wayne Gardner, winner of the inaugural Australian Motorcycle Grand Prix at Phillip Island, Gardner Straight Grandstand is located on the main straight at Phillip Island. The prime location puts fans in the hot seat with views of pit lane, the team garages and the bikes as they roar out of Turn 12, along the circuit’s 900 metre main straight, across the start/finish line and disappear over the horizon and into Doohan Corner. Perched on the eastern side of the Phillip Island circuit and flanked by the wild waters of Bass Strait, Siberia Grandstand is a true fan favourite, regarded by many as the best seat in the house. 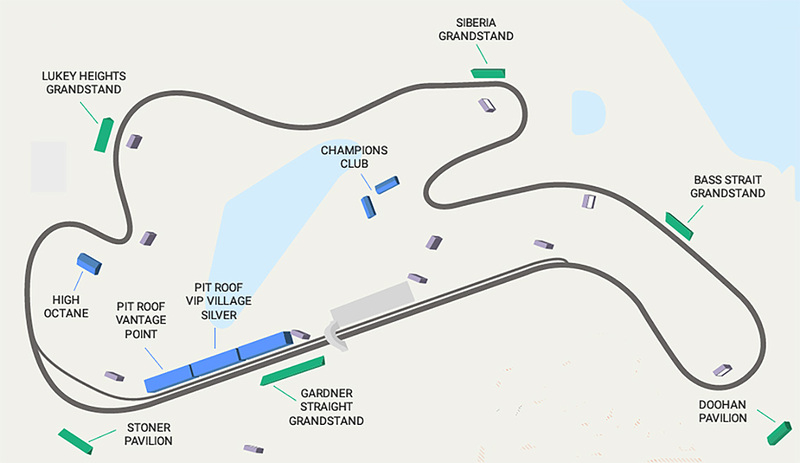 The grandstand’s prime location provides spectators with unmatched views as the bikes negotiate the Turn 4 hairpin, climb through Turn 5 before flashing through Siberia’s sweeping Turn 6 and roaring off towards Turn 7 and the circuit’s northern reaches. Located on the outfield at Turn 12, Stoner Pavilion was named in recognition of the achievements of six-time Australian Motorcycle Grand Prix champion, Casey Stoner. Combining an open grandstand with views of the track and infield Superscreen opposite, and an undercover marquee just steps away to the rear, the Stoner Pavilion is the perfect location to enjoy the circuit its namesake once described as: “a classic track beyond anything else we race on”. As a Stoner Pavilion patron you’ll enjoy access to exclusive facilities including a cash bar, food and beverages and private TV screens so you never have to miss a moment of the on-track thrills and spills. Located on the outfield at Turn 2 on Phillip Island’s Southern Loop, Doohan Pavilion is the ultimate grandstand experience. The Doohan Pavilion features undercover grandstand seating and access to an exclusive pavilion at the rear of the grandstand with a cash bar, food, drinks and private TV screens so that you can keep up with the race when you’re away from your seats. As well as putting you in pole position at Turn 2, Doohan offers sweeping views of Turn 1 (AKA Doohan Corner), Stoner Corner and Turn 4, and the Superscreen located directly opposite ensures you won’t miss a moment of the action elsewhere on the circuit. Feel the suspense as riders appear into view as they crest Lukey Heights and descend into Turn 10 to tackle two of the circuit’s most challenging turns. This key overtaking spot is never short of action. 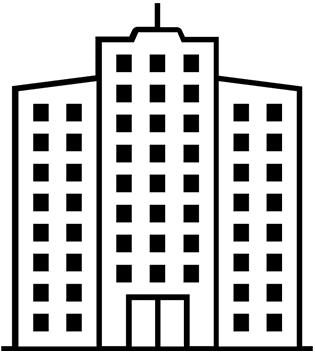 Key features include outdoor viewing area with garden tables and chairs, morning and afternoon tea, full hot buffet lunch, beverages including beer, wine, cider, sparkling, soft drink, tea and percolated coffee. With views all the way from the Southern Loop to Siberia, Champions Club is in the prime position for you to take in the thrilling race. With beautiful Bass Strait as your backdrop, you’ll be spoilt for action as riders sweep through the high speed Stoner Corner, before braking hard for the hairpin at Turn 4. Key features include outdoor viewing area with garden tables and chairs, morning and afternoon tea, full hot buffet lunch, beverages including beer, wine, cider, sparkling, soft drink, tea and percolated coffee. Located above the pits and team garages on Gardner Straight, the Pit Roof VIP Village Gold suite puts you right at the heart of the action. It offers amazing view lines, all the way to the circuit’s white-knuckle finish. You won’t miss a second as the world’s best riders push themselves to the edge. Morning and afternoon tea, full hot buffet lunch, beverages including premium beer, wine, sparkling, cider, soft drink, espresso coffee and tea Reserved seating. Access to the Pit Roof Bar with views of Turn 12 Glass fronted structure with access to outdoor balcony and Daily Pit Lane Walks. Is this not quite what you’re looking for? Check out our other Motor Sport options! Any trip to Africa will transport you to a land of legends. A land where scenes from the Lion King can be experienced first hand and one that remains close to the hearts of all visitors. The world’s least visited continent. The final frontier on Earth. A once in a lifetime experience that leaves a lasting impression. 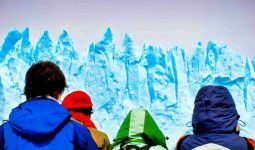 Discover our top 5 experiences to make your next expedition truly unforgettable!